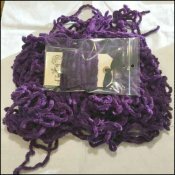 Wizard Cotton Chenille  - $6.00 : Yarn Tree, Your wholesale source for cross stitch supplies. Item 8727. Wizard Cotton Chenille. 100% cotton. 3 yards per package. Hand dyed trims for finishing. This color chenille trim has been used by Hands On Designs to finish some of her patterns. Please note that each fiber content accepts dye differently for the different shade variations between cotton chenille, polyester pompoms, rayon ribbon, and rick rack.